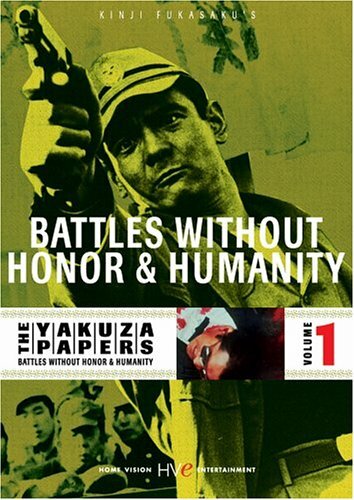 The Yakuza Papers Vol. 1 - BUY THIS DVD! Kinji Fukasaku's (BATTLE ROYALE) revered gangster series is a landmark of 1970's Japanese cinema. Set just after WWII and based on the memoirs of a real-life crime boss, these films serve to deglamorize the traditional cinematic portrayal of organized crime, instead painting its members as petty, backstabbing thugs who will turn on their closest allies for power or profit. The story follows the violent exploits of Shozo Hirono (Bunta Sugawara), a former soldier, as he joins a yakuza gang in post-bomb Hiroshima. From there, he weathers a brutal series of events, including jail terms and pulling off hits of rival gang members, on his shaky journey through the ranks. Sign Up For The Home Vision Newsletter - CLICK HERE! THEN SEND IN YOUR NAME AND ADDRESS TO contests@efilmcritic.com. Put "YAKUZA VOL. 1" in the subject line and cross your fingers. We will draw names and one of the DVD packages from Home Vision will be yours. Only 1 entry per household.